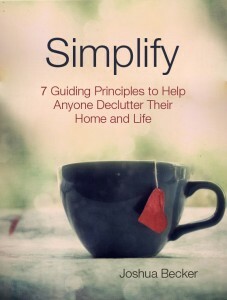 In February, 2010, we released a book, Simplify: 7 Guiding Principles to Help Anyone Declutter Their Home and Life. Through personal stories, practical tips, and powerful inspiration, it provides motivation for readers to live more life by owning fewer possessions. The book reminds us that life is too valuable to waste chasing possessions. It argues that each of us can experience practical, life-giving benefits by owning less. When we intentionally choose to reduce our possessions, we find more time, energy, and finances to pursue our greatest passions. And we experience the true freedom of simplicity. Simplify is based on a rational approach to minimalism. It will forever change the way you look at physical possessions. And most importantly, its approach will free you from the burden of clutter and provide you with the extra motivation to realign your life around your heart’s greatest passions—however you choose to define them. It may provide the very inspiration you need to fully declutter your home and life. Simplify can be found wherever digital books on sold: Kindle | Nook | PDF | Kobo. The price is $2.99.